Last week was the 1st in which the SPX failed to make a new high since November. 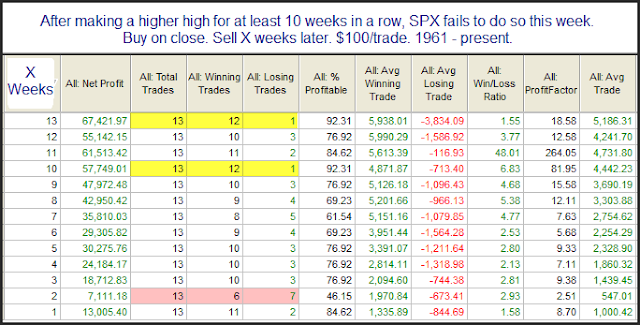 Prior to this it had been 12 straight weeks of higher intraweek highs. In last night’s subscriber letter I took a look at other times similar streaks existed and what happened after they ended. Below is a study that showed results of instances with at least 10 consecutive higher highs. It’s tough to draw too much from the low number of instances. Early indications suggest the market is not immune from a short-term pullback, but that past instances have not marked major tops. 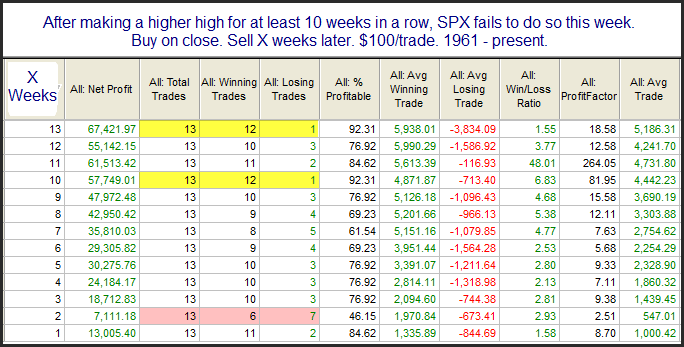 If you want to take a closer look at other instances like the present where the SPX made higher highs for at least 12 weeks before faltering, it occurred on 11/5/65, 3/17/72, 1/8/93, 8/15/97, and 4/17/98. A theme I have found in my research is that persistent uptrends rarely end abruptly. Often they will chop for a while and lose their persistence before rolling over. While much of this research has been focused on the daily timeframe, studies like this suggest it may also apply to weekly timeframes as well. I ran a test looking at gaps down of 0.75% or more following a US - only holiday. No edge was evident. The Traders Expo will be held at the Marriot Marquis Hotel in NY from February 20th - 23rd. I'll be making the trip. I am scheduled to speak on the 21st from 1:30 - 2:30pm. Topics in my talk include Fed-based edges, how market position affects short-term patterns, aggregating studies, and more. I'd welcome the opportuntiy to meet blog readers and subscribers. Feel free to stop me if you see me, or come by after the presentation and introduce yourself. I look forward to meeting some of you there. In the last installment of "Using Quantifiable Edges to Your Advantage" I began discussing some of the tools available to subscribers. In that post I discussed the Catapult & CBI in great detail. Today I will review several other tools available to subscribers (though not in as much detail). I've discussed several of these before so blog readers may be familiar with some of the below. 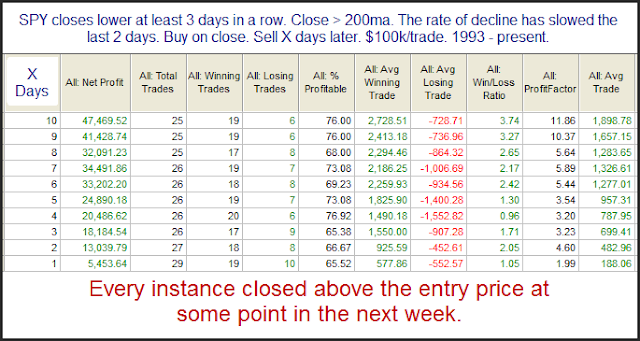 The Aggregator - Much of my market bias is determined by the studies I conduct and consider "active". The Aggregator is the tool I developed that weighs the estimates from those studies and gives me a bottom line bullish or bearish expectation. I also use a separate calculation called the Differential that measures recent market performance versus recent expectations. The Aggregator is the number one tool I use in determining my bias and setting up my index trades. More information on the Aggregator can be found by clicking the link below. The Quantifinder - Over the course of the last three years I have published over 1000 studies in either the blog, the subscriber letter, or both. Studies that appeared to me to either have a substantial edge or to be notable and worth reviewing in the future are included in the Quantifinder. The Quantifinder is an engine that examines the current day’s market action and determines whether any of about 900 studies would trigger based on today's action. Any studies that appear pertinent are automatically referenced and a link is provided so that users can go back and read what I wrote about the current setup the last time it occurred. More detailed information on the Quantifinder can be found by clicking the link below. The Charts Page - Quantifiable Edges tracks a number of unique indicators on its charts page. These include indicators such as the CBI, the 3/10 Offset HV, the Volume SPYX indicators, and more. The Archives - The Quantifiable Edges Subscriber Letter is now three years old. Over the last three years there has been some amazing market action which has led to a massive amount of research. All of Quantifiable Edges past letters and published research are available to subscribers for easy viewing in the archives section of the website. Many subscribers find themselves reviewing old letters thanks to being sent there by the Quantifinder, but if you feel current action is similar to something you've seen over the last few years and you want to see what research I was discussing then, you can simply pull up those letters on the archives page. The Downloads Page - Over the last three years I have created a number of studies and special reports. Several of these along with special coding and spreadsheets can be found on the downloads page in the members section of the website. Educational Videos - in 2010 I began hosting webinars for subscribers once or twice a month. In these webinars I discuss topics such as the Aggregator, the Catapult System, how to run back tests across large lists of securities, POMO indicators, day trading opening-range breakouts, and more. I have archived many of these webinars and made them available for subscribers to view any time. Proprietary Data Download - Subscribers that like to do their own tinkering and development can download historical data on several Quantifiable Edges indicators. 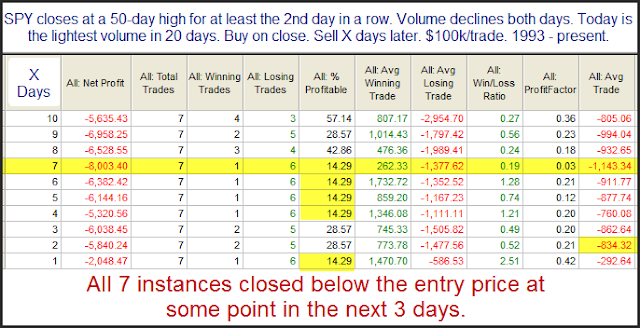 Data is available for the Volume SPYX indicators, the CBI, and the Aggregator. The Subscriber Letter – The tool most utilized by subscribers is the nightly letter. It arrives nightly and is complete with my research and studies for the day along with my interpretation of recent studies. The Aggregator chart is always included and discussed, and the intermediate-term outlook is updated at least once per week. Additionally, it contains trade ideas that have been tracked and recorded over the last 3 years. It is not a tip-sheet, but the trade ideas, whether they are index trades, Catapult trades, or something else, have done quite well since the inception of the letter. They can all be found on the Trade Idea Results Spreadsheet, which is downloadable from the System page on the website by members at any time. It all began with the subscriber letter. And while that has changed some over the years, the majority of the enhancements have come on the website. How traders ultilize the research, the letter, the indicators, and the systems is up to them. There is a lot available. Hopefully this series of posts will help new and experienced readers alike to better take advantage of Quantifiable Edges, regardless of whether you have a subscription or whether you just read the blog. This completes “Using Quantifiable Edges to Your Advantage” – for now. New features will be released over the next several months and I’ll be sure to add them to the end of this series once they are available. Since the 1/28 market drop due to Egyptian protests the market has risen without hardly a pause. It has now been 2 weeks since the last time SPY closed above its 5-day moving average. The 5-day is quite short-term so this is a fairly rare occurence. The study below examines other instances where this has happened. Such persistence doesn’t typically last much longer before a pullback is seen. We see above what appears to be a decent downside edge. It appears most of the downside damage is done in the first 2 days. Low volume at a new high can often be concerning, whether it be NYSE volume or SPY volume. In last night's subscriber letter I looked at a couple of volume-related studies with moderately bearish inclinations. I then combined them to see what would occur. The study below shows the result of the combination. Now the number of instances is quite a bit lower here than I typically like to see, but I found the results interesting and the consistency extremely strong. Using QE to Your Advantage - Subscriber Tools 1 - The Catapult & the CBI. So far in my series, "Using Quantifiable Edges to your Advantage" I have focused on the historical analysis studies, how to interpret them, and how to apply them to your trading. In the next few segments I'm going to highlight and discuss some of the tools available to Quantifiable Edges subscribers. The first set of tools I'm going to discuss is the Catapult System & the Capitulative Breadth Indicator (CBI). I designed the Catapult System in 2005. 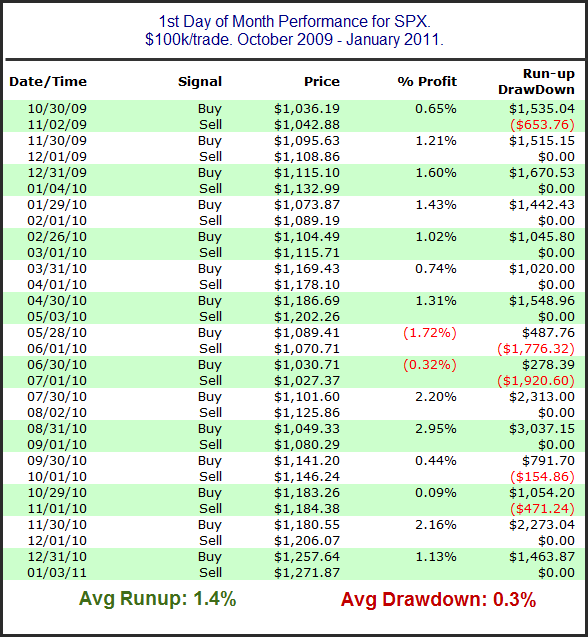 At the time much of my trading revolved around trend following. One of the holes identified in my trend following approach was that it didn't allow me to benefit from explosive reversals and short covering rallies that often occurred near bottoms. I often missed good portions of rallies because I was waiting for trend confirmation. After considering this for some time I decided to try and develop a complementary system to my trend following approach. Since my exposure would typically be quite low during these bottoming events I figured a methodology that could take advantage of them for short-term gains would work quite nicely. I could benefit from the reversal and then be out of those trades and ready to get back into some trend of trades as the new trend confirmed and those trades became available. It was this line of thinking that led me to develop the Catapult System. And though I don't do as much trend trading these days, and instead focus more on swing trading, I've still found the Catapult System to be very valuable. Two things I found important when considering the predictability of capitulative selling resulting in a reversal were 1) institutional ownership and 2) liquidity. It is for this reason that I have always demanded both for trading individual stocks. For ETFs I don't really worry about institutional ownership, but I do demand liquidity. The Capitulative Breadth Indicator (CBI) is basically just a count of the number of open catapult trades among S&P 100 stocks. I've charted and discussed this indicator many times since beginning the blog in 2008. I've been able to generate the CBI using back tests from 1995-2005, and then using real-time data from mid-2005 to the present. My basic finding has been that high CBI readings have often been followed a strong reversals. Basically the more individual stocks you have suggesting selling has become too extreme and a reversal is likely, the more likely a broad market reversal becomes. The graphics below I've just produced for the first time. The top of each chart shows the S&P 500. The indicator on the bottom is the CBI. One way I track catapult trades is by "clusters". A cluster of trades begins when the CBI moves above zero and it ends when the CBI returns back to zero. Historically I found over 90% of clusters would have been net winners had you taken all the trades in the cluster with equal size. Above each cluster in the charts below is a number. That number shows the net additive gains (or losses) that would've been generated by that particular cluster. Lastly, let's examine the 2010 chart. There have not been any catapult trades so far in 2011, and very few since the market rally began in July of 2010. The good times won't last forever though, and I'm afraid we are likely to see more big market drops occur in the next few years. Quantifiable Edges is prepared to try and take advantage of these drops using the Catapult System. If you think the catapult system might work as a new weapon in your arsenal and you'd like to learn more about it you can sign up for a gold membership here, or a trial subscription to Quantifiable Edges here. The fact that the 10-year bond rates hit new highs Friday along with the SPX is notable. The study below last appeared in the 12/9/10 subscriber letter. Stats are current. Generally it seems that higher interest rates have often made bonds an attractive investment. This may lead people to forsake stocks in favor of lower risk returns with improved yield. Implications of this study appear to be longer-term in nature than we usually see. We are still not 50 days out from the 12/8/10 occurrence, but that one appears unlikely to finish in the red. Over the last two months more bullish forces have had their way. In last night's letter I showed how this edge has been consistent since the late 60s / early 70s. I view this occurence as an intermediate-term warning sign. More than anything it was the light volume that appeared most notable about Wednesday's action.. Light volume pullbacks are generally regarded as bullish. Yet in my research I have found that when pullbacks begin on very light volume the pullback has a good chance of deepening. Today’s mild pullback in the SPX occurred on the lightest NYSE volume in over 2 weeks. These results suggest a mild bearish edge over the 1st 6-7 days. The edge is not the most reliable as the “% Profitable” is close to a coin toss. The edge lies in the fact that downside risk has strongly outsized reward. I took a more detailed look at this last night in the subscriber letter. A few caveats to consider. The huge snowstorms may have had a dampening effect on volume. Also, while this study suggests a possible downside edge, there are studies I am seeing that suggest upside. Things aren't cut and dry right now. I've discussed the tendency for the market to rise on the 1st day of the month before. In July of 2009 I broke out the performance by month. Recently I've noticed this edge has shown even stronger tendencies - most notably the last 15 months. Below is a performance report showing the 1st day of the month from October 2009 through January 2011. Extremely lopsided stats. An average gain of nearly 1% is quite impressive. Below is a listing of all the instances.